Luke Adams' handblown desktop cacti make adorably unique additions to a desk or windowsill. 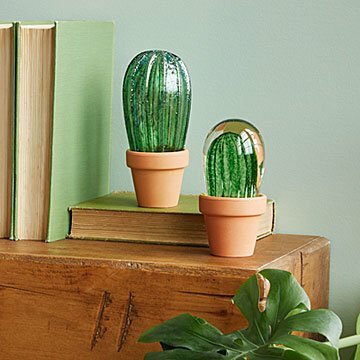 At once gorgeous and whimsical, Luke Adams' handblown desktop cacti are adorable additions to a desk or windowsill where they'll catch the light. Perfectly potted and never in need of water, their rich colors will add a little desert flavor to your office or home. The Torch Cactus is bright green; the Spurge, a more muted shade, with mottled black. They make charming, unexpected housewarming or birthday gifts for friends and coworkers who love succulents. Sold individually. Handmade in Norwood, Massachusetts. "The first time I opened that kiln," says Luke Adams, "I knew I was hooked. That flame, that heat. It’s hypnotic." The addictive and rewarding process of working with glass led him to build his own studio in Norwood, Massachusetts. "It’s really fun to do something with glass," he says. "It's such a unique material." Eventually, his brother joined him, and the studio has since grown. He now works with a small staff of glass blowers who, in addition to teaching classes, produce hundreds of pieces daily, as well as their own beautiful works. Ornaments they created have been featured on the holiday tree at the Smithsonian National Museum of American History. To keep up with the demand for their work, the studio furnace, filled with 300 pounds of molten glass, stays at 2030 degrees, 24/7. Carefully wipe with damp cloth.